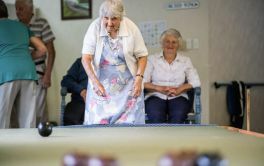 Retirement Villages, Rest Homes and/or Aged Care facilities, Rotorua. # 1 of 16 facilities. # 2 of 16 facilities. # 3 of 16 facilities. Cantabria Village will be a place to get the most out of your retirement. Recognising the individual needs of our residents and to promote a friendly and comfortable environment is an important part of our philosophy. You won’t have to worry about maintenance - it’s all taken care of. # 4 of 16 facilities. # 5 of 16 facilities. # 6 of 16 facilities. # 7 of 16 facilities. Semi ensuite bedrooms, 3 lounges, dining, kitchen and Laundry. Large north facing deck over the rear gardens. St Barnabas Close Village will be a place to get the most out of your retirement. Recognising the individual needs of our residents and to promote a friendly and comfortable environment is an important part of our philosophy. You won’t have to worry about maintenance - it’s all taken care of.